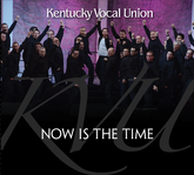 Purchase KVU's CD "Now Is The Time"
The Kentucky Vocal Union is releasing its newest studio album, Now Is The Time, just in time for our appearance in the the 2014 Barbershop Harmony Society international chorus contest. We've been working hard the past nine months to put the best of the KVU on this recording, and in addition to the eight songs listed below, we've also included studio recordings of our 2014 international contest set, Man In The Mirror and Thriller. A portion of the proceeds from the sale of this album to benefit The Living Waters Guatemala Project. Thank you for your support of the Kentucky Vocal Union! Purchase Now Is The Time by clicking the Buy Now button below. The Living Waters Guatemala Project is a mission of First Presbyterian Church, Elizabethtown, KY and the Elizabethtown Rotary Club. Trained volunteers install water purification systems in Guatemala mountain communities that have no access to safe drinking water. Operating partners take ownership of the systems and are trained to share the gift of clean water. Let clean water flow for all God’s children in Guatemala!